The day is unfolding in a mystical fog that talks to my heart right now. As I gaze out my window, I am reminded that this life is a Leap of FAITH! It's like walking into a fog. Not quite sure where the next baby step might lead, but certain that to move forward, one must take the step on the path in front of you. Seriously, that is exactly what I did when I wrote the submission for the SAQA Exhibit back in February. Took a Leap of Faith. As I shared with you this summer, I was doing the HAPPY DANCE at "Congratulations on having your work Portals: Past, Present, Future accepted into the SAQA Global Exhibition “Metamorphosis”. Last week, upon my return from a visit to Wisconsin where I attended my 51st high school reunion, (what an experience! for details, you will need to call me) I received the printed catalog of the exhibit. Holding that book in my hands gave me a jolt of reality. This is really happening!! Last April, I attended the Chicago show with my friend Annie, not yet knowing that my submission had been accepted. As we walked through the exhibits, we fantasized and giggled at one day having one of my quilts displayed there. Thoughts really Do Become Things! Portals: Past, Present, Future sold this morning at Quilt Market Houston! Thank you for loaning your art to SAQA’s global exhibition program. We are very happy to have the opportunity to share your work with so many people from around the world and to have facilitated the sale of the piece. Please note that the artwork will continue to travel with the Metamorphosis exhibition through December 2021." So now I am OVER THE MOON with excitement! If this is what happens when we take a leap of faith, then I will continue to take the baby steps on this path! Below, I have added a photo of the piece and the Artist Statement. I will keep you updated on the venues where it will be shown. On the Homefront, my family is pretty excited with me as well. Eric's family will be joining Heidi's family and us next week for Thanksgiving. I am up to my ears with planning meals and activities. FAMILY is and always has been most important to me. When I think about Thanksgiving and the upcoming Holiday season, I continue to count my blessings. I am very grateful for YOU, my DEAR ONE. Thank you for going on this adventure with me by supporting me through the years. You have no idea what that has meant to me. Be Happy. Stay healthy. Until we our paths cross again. Intrigued by the circular design, mandalas are the focus of my portfolio. PORTALS - PAST, PRESENT, & FUTURE gratefully represents how the work of our hands, ancestors and my own has evolved. The outside ring is a repurposed embroidered tablecloth. My mother taught me embroidery stitches as a girl. It was the beginning of my sewing passion. The inner portal is created using striped fabric cut into wedges then sewn together forming a ring. It represents the techniques used by women coming together in their quilting bees. Gathering every available fabric to tell stories in their heirloom quilts. The center portal was painted and stitched with the stenciled words 'I AM'. 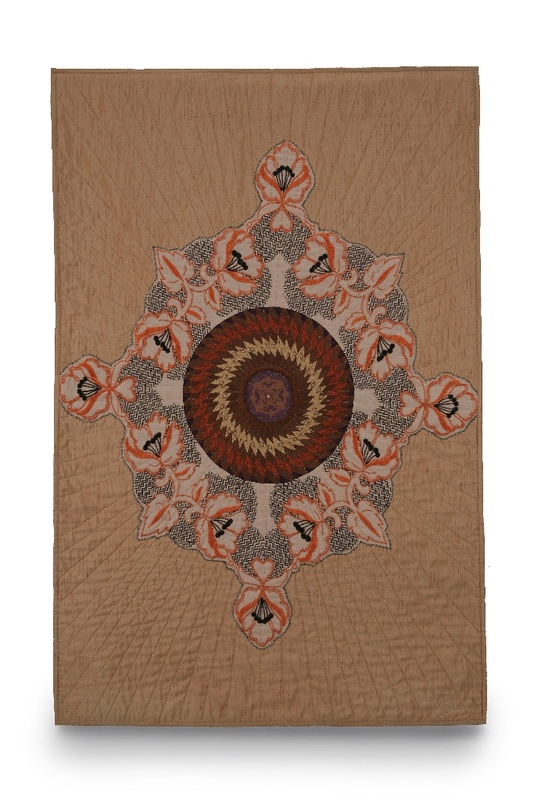 The design represents the independence of current creators of fine art quilts that go beyond the utilitarian bed quilts of our ancestors. The crystal at the very center represents the SPIRIT that leads us forward, lights our path, and directs our way. It is the Energy of the MUSE that is reflected in the work of our hands.